Public violence, a persistent feature of Latin American life since the collapse of Iberian rule in the 1820s, has been especially prominent in Central America. Robert H. Holden shows how public violence shaped the states that have governed Costa Rica, El Salvador, Guatemala, Honduras, and Nicaragua. Linking public violence and patrimonial political cultures, he shows how the early states improvised their authority by bargaining with armed bands or montoneras. Improvisation continued into the twentieth century as the bands were gradually superseded by semi-autonomous national armies, and as new agents of public violence emerged in the form of armed insurgencies and death squads. World War II, Holden argues, set into motion the globalization of public violence. Its most dramatic manifestation in Central America was the surge in U.S. military and police collaboration with the governments of the region, beginning with the Lend-Lease program of the 1940s and continuing through the Cold War. Although the scope of public violence had already been established by the people of the Central American countries, globalization intensified the violence and inhibited attempts to shrink its scope. Drawing on archival research in all five countries as well as in the United States, Holden elaborates the connections among the national, regional, and international dimensions of public violence. 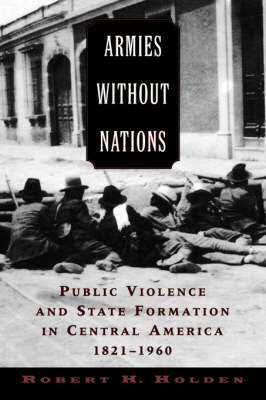 Armies Without Nations crosses the borders of Central American, Latin American, and North American history, providing a model for the study of global history and politics. Armies without Nations was a CHOICE Outstanding Academic Title for 2005.